Learn how to correctly use an avalanche beacon at the free monthly clinics at Squaw sponsored by the Squaw elite team – Squaw Dogs. The workshop takes place from 5:30-7:30pm at Ski Patrol Base in the Red Dog Complex. Throughout the ski season, free avalanche workshops take place on the 1st and 15th of each month (Dec. 15 – April 15). 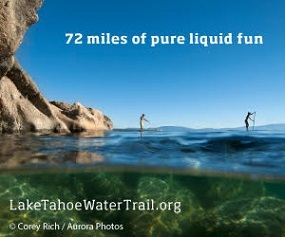 Squaw Valley Professional Ski Patrol Snow Gods Avalanche Education Fund sponsors this event. Ski patrol crew will also talk about avalanche awareness, the RECCO avalanche technology and the Squaw Valley Ski Patrol dog program. Find out more about the important role patrol dogs play in mountain safety and Tahoe ski culture. The Squaw Dogs provide a service not only to the Squaw Valley skiing and riding community, but to the greater Lake Tahoe community as well. 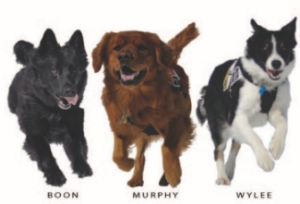 All of the Squaw Dog teams are also members of the Placer County Sheriff Search & Rescue Team. Please RSVP by calling 530-452-7260. Beacons are provided for you to practice with or you can bring your own. Click here to learn more about Squaw Dogs, dedicated to Avalanche Rescue and Education. Spending his whole life in Lake Tahoe, Pete has been fortunate enough to grow up skiing Squaw and now patrols there. Joining the dog program in 2001, Pete picked up Tucker in 2003 and has trained him to the CARDA standard. Tucker is a handsome 6 year old male Golden Retriever. 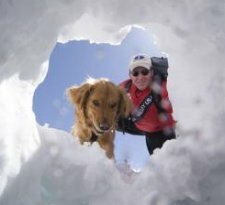 Co-Founder and board member of the Placer County Sheriff’s SAR Tahoe Dogs Team, Pete has played an integral part in creating this regional avalanche rescue dog team. Pete earned a BS from the University of Nevada and is also a certified instructor in OEC, NSP Avalanche Level 1, Lifeguard Training, and CPR. Pete also works with RECCO overseeing the training of this advanced rescue technology to ski patrols on the west coast of the US. Enjoying all outdoor activities, when not on the fire line in the summer, you can find Pete on the water racing sailboats or just trying to sneak in a bike ride or a round of golf with friends.